I saw this tag on Love from Be and since I love me a good tag, I thought I'd give it a go! I started blogging at the end of last June. I think I was going through a rough period in my life and I honestly thought that reading other people's blogs and what they were going through got myself through it. I'd always loved things like that (I was such a pro at html codes back in my Myspace days!) 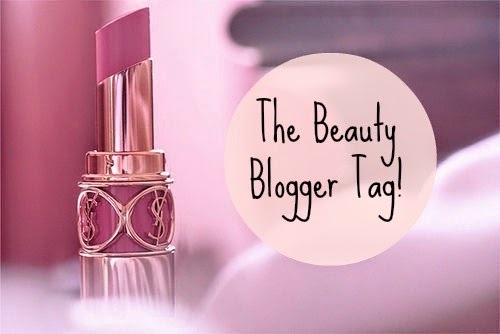 and since I was a complete girly girl with LOADSS of products to review, I decided on starting my own beauty blog. 2. How many people "in real life" know about your blog? I wouldn't say I'm embarrassed about my blog, but it's a ME thing and I'm not quite ready to start talking about it. Since moving out, I'm really into Home Decor and DIY. I've never made anything decent in my life but all of a sudden I'm desperate to start! Wow! Too many but I did enjoy Jade's Big Mac in a Bowl recipe, even so that I made it myself! 6. Any advice for future bloggers? Pick an area you're interested in. Make blogging something you enjoy. Post regularly. Followers will get bored if you don't have new material. Buy a notepad/diary so you can write down ideas for posts. I'm always out and about and think of something good but then always forget it when I get home. Get sociable! It's always good to make new friends through blogging. I now tag everyone reading this!